The objective of Blackjack is for a player to come as close to 21 without going over, while still having a higher number than the dealer. Prior to receiving any cards, the player must place a wager. Once the wager is made, the player is dealt two cards face up. The dealer is also dealt two cards. If the total value of the player’s cards is closer to 21 than the dealer, the player wins as much as he wagered. The player wins if the dealer goes over 21. - the Player may make any wager desired within the posted table limits. - the Player gets two cards face up and the Dealer gets two cards. – is achieved when first two cards total 21. Blackjack beats a score of 21 consisting of 3 or more cards. – is achieved when total value of cards for either the Dealer or the Player exceeds 21 resulting in a loss of the wager. – is achieved when the value of the Dealer’s cards (from 17 to 21) and the Player’s cards are equal resulting in neither winning. It also results in the return of the Player’s wager. – Player desires another card to be dealt. – Player desires hand to be split two cards into separate hands. – Player desires to double bet and receive another card. Suits of the cards have no meaning in the game. Cards 2 through 10 are the face value. Jacks, Queens and Kings are all valued at 10. (except in the game of “Caribbean 21”where the Ace has a value of 1 only). If the player has a hand that consists of a 6 and an Ace, he may either consider it at 17 or drop its value to 7. The Ace may count as 1 or 11. You may change the value of the Ace as the hand progresses. Clicking on the deal button after placing a bet starts a new game. Clicking on the hit button will deal the player an additional card. Clicking on the stand button will keep the player’s hand at its current value. If a player splits two aces, he receives only one additional card for each hand. A hand totaling 21 after splitting aces is considered 21, not Blackjack. When a player has been dealt two cards and believes that a third card will give him a position to beat the dealer’s hand, he can “double.” His wager is doubled, and he is allowed to hit and receive just one additional card. Insurance gives the player a chance to protect himself when he believes the dealer might have Blackjack. If the dealer’s first card is an ace, he is considered to have a fair chance of getting Blackjack. 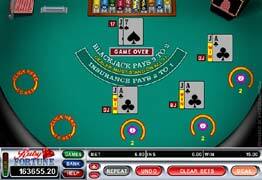 If the player believes the dealer’s hole card (face down) value is 10, the player may purchase insurance against dealer Blackjack at the price of half their initial bet. If the dealer does have Blackjack, the insurance pays 2 to 1, which corresponds to the amount of the initial bet. 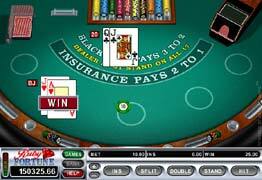 If the player has bought insurance and the dealer does not have Blackjack, the player loses his insurance. The player’s initial bet is then settled by comparing his cards with the dealer’s. If the dealer and the player both have Blackjack, the game results in a push. Player gets two cards face down. Dealer gets two cards, one face down and one face up. Hands which contain an ace valued at 11 are considered “soft” hands (i.e. A6 is a soft 17). Hands containing an ace valued at 1 are considered “hard” hands (A, 6, K is a hard 17). A game where you are dealt up to 5 hands of cards and play all your hands against the dealer's single hand. The object of Multi hand Blackjack is to obtain the highest possible value without exceeding 21 on each hand. The Player may make any wager desired within the posted table limits. The Player gets two cards face up. The Dealer gets two cards face down. The objective of Pontoon is for a player to come as close to 21 without going over, while still having a higher number than the dealer. Prior to receiving any cards, the player must place a wager. Once the wager is made, the player is dealt two cards face up. The Dealer gets two cards – one face down, one face up. 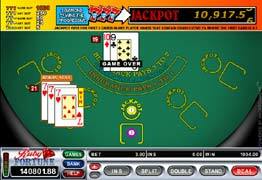 Triple Sevens Blackjack is based on standard Blackjack and has a side bet that makes you eligible for additional payouts, one of which is the Progressive Jackpot. Three consecutive Diamond Sevens qualify for the Progressive Jackpot. The Dealer gets two cards face up. The Dealer gets one card face up. - any time up to 7 times. *The Dealer wins all ties. **Aces are worth only 1 point. The rules are the same as in standard Blackjack (see here). Except you have two hands, which you play in turn – first the right and then the left one, then the dealer plays his hand. You may split, double, take insurance etc. just like in standard Blackjack. An exception from the standard Blackjack is that the dealer always hits soft 17 – meaning he always draws one more card when he has 17 with an ace counted as 11. Also, ‘Blackjacks’ pay 1/1 instead of 3/2 although more ‘Blackjacks’ are created due to the ‘switching’ option. (See below). Another exception is that Blackjack rule no. 5 (“If the player doubles and the dealer’s first card is of value 10, and the dealer gets blackjack, the player loses only the initial bet.”) does not apply in Blackjack Switch. Prior to any hits, you may switch the top cards of your two hands. Dealer will “push” on a total of 22 (except 'Blackjacks' will still win). This means that whenever the dealer's total reaches 22 then all bets are 'pushed', regardless of their total except if a player has a ‘Blackjack’, which will still win. The small circle between the standard bet areas is the super bet area. The super bet wins if your initial 4 cards contain 2 or more matching cards. For example, if your right hand is a Queen and a Six, and your left hand a Queen and a King, you have a pair and your super bet wins. The win ratios are written on the table.